Grateful Dead drummer Mickey Hart, tabla master Zakie Hussain and other eminent percussionists who comprise this time-honored outfit continue with their navigations of life's heartbeat. This studio session commemorates the fifteenth-anniversary of the influential Planet Drum (Rykodisc, 1991). Pristinely recorded, the artists use some of the latest and greatest studio processing techniques to augment the inherent instrumental elements. With oscillating chants and orations intermixed, the musicians merge tuned percussion and stringed-instruments into pulsating world-groove motifs. The sonic treatments are tastefully done and not over-baked, where they primarily use effects for texture and ornamentation. And within various movements Niladari Kumar's resonating sitar lines provide an echo-chamber type foreground to trickling, spiritualized vocals and mellow dreamscapes. On the album's closer, "I Can Tell You More, the ensemble renders a budding rhythmic foundation amid Hart's narration that is tinged with reverberating fade-outs. These ambient-electronic shadings remain consistent throughout, where the producers augment the matters at hand with an ethereal edge. But just when you're expecting more goodness, the album ends at forty-two minutes. However, the qualitative aspects shine radiantly during this tightly-coordinated and entertaining installment of the unit's latest percussion jamboree. It's all executed with a prophetic sense of good cheer. Track Listing: Baba; Kaluli Groove; Funky Zena; Under One Groove; Dances With Wood; Heartspace; Tars; I Can Tell You More. 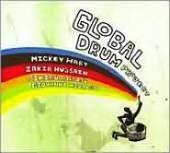 Personnel: Mickey Hart: percussion and vocals; Zakir Hussain: percussion and vocals; Giovanni Hidalgo: Latin percussion; Sikiru Adepoju: talking drum; Babatunde Olatunji: vocals (1); Taufiq Qureshi: percussion and vocals; Niladari Kumar: sitar; Dilshad Khan: sarangi.